Natural Church Development (NCD) is a paradigm – a way of thinking about church growth by first thinking about church health. Growth should be about quality (health) and not just quantity (numbers). In fact NCD suggests that quality should take priority over quantity in church growth thinking. At the heart of the paradigm is the Scriptural picture of the church as a living organism, not just an organization (albeit a spiritual one). Looking at the church "organically" gives us a different perspective on what "growth" means. The growth of organisms focuses on their health, their capacity to reproduce, and how the individual 'body' parts interact. They are grown, not built. They are nurtured, not assembled. The NCD paradigm says that if church growth is about growing an organism, the health (quality) of the organism will have a direct impact on its size (quantity). If a church becomes increasingly healthy over time, it is more likely and better able to reproduce disciples, ministries and eventually itself. How many times have church leaders counted the numbers of people in Sunday services but really have no true sense whether the members of the church community are growing to greater spiritual maturity and contributing all they can to the Body of Christ and the Kingdom of Heaven? Is size really a true measure of health? The NCD paradigm helps you think about growing your church as a healthy living organism. But not merely "think" about growing your church: it also involves developing the will to do so. Jesus famously asked the paralytic, "Do you want to be made well?" 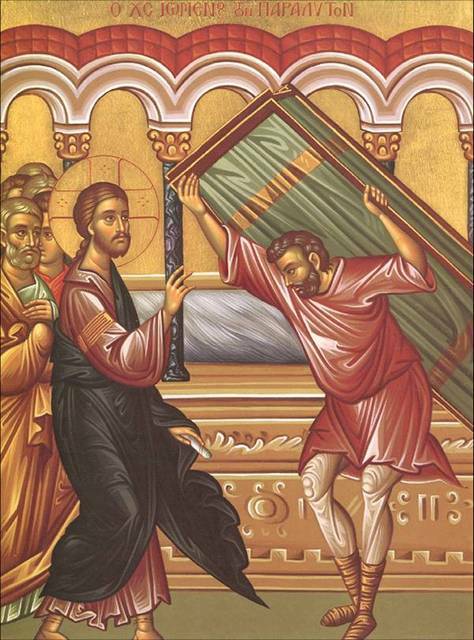 The paralytic, never knowing what that was like, did not really know how to answer the Lord. In many parishes today, corporate sickness and dysfunction have been the "reality" parishioners have had to confront for so long, they don't know what "normal" or "healthy" is anymore. NCD gives them a way to heal and recuperate, to regroup, replan, and begin the process of God-given and God-mandated growth. NCD is also a long term strategic process for progressively improving a church's health. It is a process of continual improvement, not a program which guarantees "a healthy church" if implemented to the letter. Growing a church, like growing a plant, requires a long term commitment which is intentional and consistently addressing the most critical issues facing the church at each stage of growth. At the heart of the NCD process is a sophisticated diagnostic tool, the NCD Survey. It is based on the only comprehensive international research ever done into what causes churches to grow or decline. The NCD Survey complies with the highest international statistical standards for validity and reliability. Surveys are done cyclically (about every 18 months), offering an accurate up-to-date "snapshot" of your church’s health. Each Survey enables the church leadership to see the current state of health, how the church's health has changed over the previous year, and what areas need greatest attention over the coming year. It reminds them that God brings the growth and their role is to partner with Him, not try to generate the growth themselves. It offers universal growth principles that apply in all churches everywhere and at all times. It provides regular accurate "snapshots" of a church's health, keeping the leadership focused on the most important issues to achieve long term sustainable growth. It helps leaders focus on essential growth values. It provides concrete input for developing or refining vision. It helps maximize the effective use of limited time, energy and resources. It confirms long-held beliefs. The following comment is common: "NCD affirms what I have been thinking for a long time, but until now nobody has done the research." NCD is not a prescriptive "silver bullet" program guaranteeing church growth. NCD is not a substitute for parish leadership motivated to achieve healthy growth. NCD is not a substitute for the unique vision that God has for each church. Every parish leader must seek the Lord for that vision. NCD helps clarify, stimulate and enable that vision. NCD is not a short term solution. Deciding to "try NCD this year" will miss the riches of exploring the paradigm….and the benefits. NCD is not a “complete package.” The NCD paradigm is dynamic, and understanding continues to grow as the international NCD community makes new discoveries in applying the principles. Holy Scripture invites us to consider the principles by which God sustains and grows living things in the world He has created. These principles are used by God to grow His Kingdom as well. Holy Scripture teaches that the local church is also a living organism which God wants to grow – the Body of Christ. The local church shares similarities with other organisms God has created and sustains. Its potential for growth lies in its health, not its size. A fundamental part of the NCD paradigm is learning to see the Church and its local embodiment, the parish, as a living organism whose growth can be stimulated by understanding and applying these principles. The role of God's people, and their leaders in particular, is similar to that of the farmer. They cannot give life and produce growth; only God can do that. All they can do is maximize the potential for growth. This is done by a continual process of identifying the barriers which impede growth within the life of the church and removing them. In this way the potential for ‘all by itself’ growth is constantly maximized. To think of the local church as a living organism is to acknowledge that quality (health) is just as important to church growth as quantity (attendance). In fact, quality is the essential foundation for quantity. The health of any living organism directly impacts its capacity to grow and reproduce. The ground-breaking international research by the Institute for Natural Church Development International has shown a clear correlation between quality and quantity: churches that continue to maintain focus on improving their health are more likely to grow numerically and reproduce ministries. Likewise, churches failing to heed the "health warning" are much more likely to be decline or making decisions that will lead to future decline. It is therefore most unwise for church leaders to measure ministry success largely in terms of quantity. It is important to recognize that Jesus speaks of 'all by itself' growth. This is not growth brought about principally by continually offering a diet of new programs. It comes by progressively understanding the dynamics of the church as a living, growing organism and continually working hard to identify and remove the barriers to its life and growth. This is what the farmer does in raising a successful crop. For many parish leaders who are used to setting the course of the church, taking their fellow parishioners with them and praying for God's blessings on the plans that have been developed, this may not be an easy shift in thinking. Many leaders see their parish predominantly as a (spiritual) organization to be built rather than an organism to be grown. It is difficult to contemplate leading a parish where 'all by itself' growth is the norm – where God's Spirit is constantly at work among His people without first seeking the blessing of the pastoral team. Yet this is the essence of the Natural Church Development paradigm. It is a process of coming to understand how God grows healthy organisms – of which the parish is one – and then cooperating with Him by doing what is necessary to remove the barriers to 'all by itself' growth. The key question the research project undertook to answer was: "What church growth principles are true, regardless of culture and theological persuasion?" Since that time, nearly 70,000 Surveys have now been completed worldwide, confirming the reliability and accuracy of the original research and that there are indeed universal God-given principles that can be applied to the unique issues in every local church. The most significant finding was that the vital ingredient of each quality characteristic was the adjective. For instance, take leadership. It was not visionary leadership, or pastoral leadership, or decisive leadership which was the chief contributor to long term healthy growth but empowering leadership. That is, the principal contributor to healthy growth by leadership was the degree to which leaders empowered their people to keep growing toward greater spiritual maturity and contributing to Kingdom growth. The same emphasis applies for the other seven quality characteristics. The leaders of parishes that are healthy, or becoming increasingly healthy, may or may not be aware that these principles are at work in the life of their parish, they may simply be employing these principles intuitively. They may use other names for these principles, or not name them at all, but they are nonetheless employing them. It shows that God is entirely consistent in the way He superintends His creation, enabling churches to grow as organisms in the same way as He brings about the growth of other organisms. Identifying these principles makes it possible to understand and apply them as part of partnering with God to grow the church. That such principles are thoroughly Scriptural should be easily seen. In some instances the teaching is direct, such as in John 15 where Jesus speaks about “fruitfulness.” In others we see the principles undergirding the message, such as “multiplication” in the Great Commission in Matthew 28. For parish leadership, therefore, understanding and applying these principles consistently until they become a natural part of parish life is essential. They are a key to releasing 'all by itself' growth. A statistical standardization which measures the parish against other parishes in North America to provide objectivity. Most importantly, the so-called "Minimum Factor", the principal focus for discussion, analysis, strategic planning and action (see below). The strategy to improve the health of the church is simplicity itself – work at improving the health of the quality characteristic that is least developed. We call this quality characteristic the Minimum Factor. Since all eight quality characteristics are essential to healthy growth, it makes sense to address the lowest characteristic, the part of the body making the least contribution to its overall health and growth. It is the most strategic use of energy and resources to maximize growth potential. 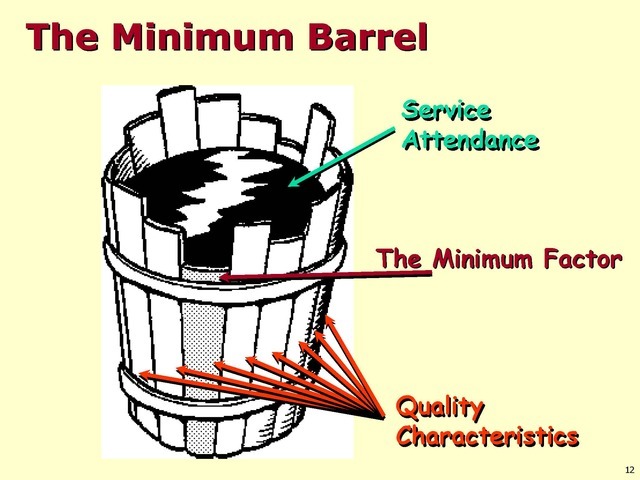 Think of the ability of a barrel to hold water: it will only be able to hold water to the level of its lowest stave, much like the picture at the right. Our churches will only be able to grow to the point where the parish's Minimum Factor starts affecting the ability of the parish to absorb and hold more people. Taking action to address the Minimum Factor brings changes to the parish’s health. The succeeding Survey reveals the extent of such change on all eight quality characteristics, that is, the overall health of the parish). The new Minimum Factor reflects the area most needing attention at the new level of health. And so it goes with each successive Survey. This ensures leaders stay focused on what is most important for long term healthy growth. More specifically, this strategy is about identifying the barriers hindering "all by itself" growth for that Minimum Factor and then taking steps to remove them, just as the farmer does in the Parable of the Growing Seed. This approach acknowledges that each church is a unique organism with a unique growth path and a unique set of emerging barriers as it grows, each requiring a unique and timely response. Focusing continuously on successive Minimum Factors as they emerge with each new Survey does not mean an abandonment of the church’s strengths. On the contrary, NCD recognizes the vital importance of engaging the church’s strengths to help address areas of weakness. The ABCs of Natural Church Development – this small booklet of 28 pages is ideal for introducing some of the main concepts to your parish. It asks why church growth can seem so hard, then looks at the eight quality characteristics, the minimum factor approach, and “all by itself” growth. It’s a fun read, and entirely Orthodox in view and approach. It is an excellent introduction to ONCD for parish councils, strategic planning, church growth or parish evangelization/revitalization ministries. 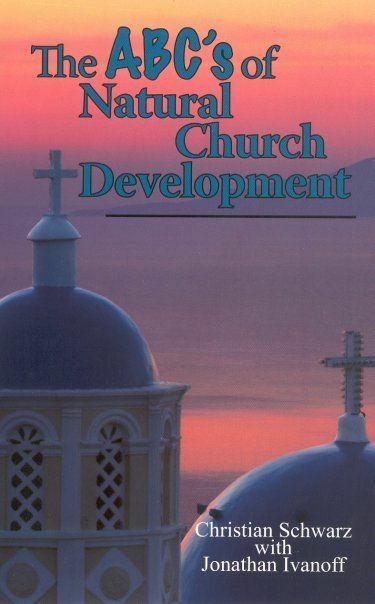 Color Your World with Natural Church Development – A "layman's" resource book that explains the quality characteristics, growth forces, Trinitarian Compass, some of the NCD tools including the Survey, and the impact of NCD on churches internationally since 1995. Natural Church Development: A Guide to Eight Essential Qualities of Healthy Churches – the original NCD “textbook,” originally published in 1996 with a new edition released in 2006. Although it covers some of the basic material in Color Your World, there are significant additions: information about the original international research and its findings; an overview of the “twin pole” paradigm that lies at the heart of our partnership with God; and an outline of the 2nd generation NCD Cycle. You can read more about these resources here on this website. There are no pre-conditions to doing a Survey. 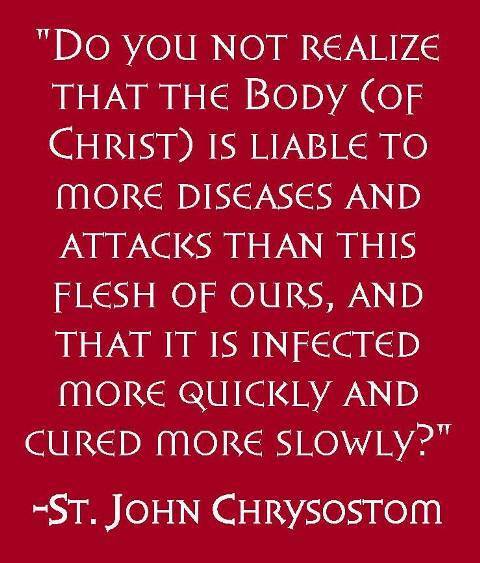 Every church can get a "health check" and begin to work on the most important issues affecting its health whenever it chooses. Is the parish currently launching significant new programs or building new facilities, activities which are consuming all available energy? Is the leadership at the point of seeking new vision or direction, or questioning the fruitfulness of current approaches? Is there a time of the year when doing a Survey naturally fits in? If, for example, you do your visioning and planning over the Summer vacation, you may want to do the Survey in the March to May period, giving time to obtain the results and get parishioner feedback before everyone heads away. Alternatively, you may do the Survey in the Fall when people are fresh and enthusiastic and wanting to engage with the issues. Are there any significant crises currently occupying the church’s leadership? It may be wise to address these first as they often take a lot of time and energy. Does the leadership of the church understand that doing the NCD Survey is not a “one off” program but the start of a long term process of continuously addressing key health issues? 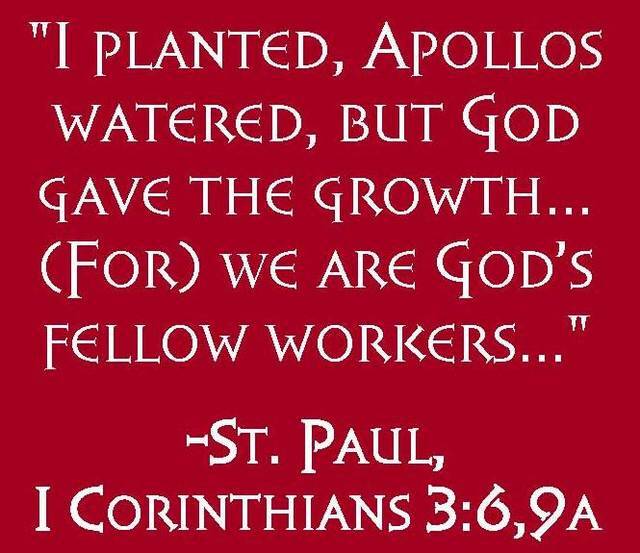 And more importantly, is there some heart for doing what it takes to grow the church, because NCD will not “do the growing” for those who have no real interest or commitment? The "mechanics" of doing the Survey - What do you need? Enough copies of The ABCs of Natural Church Development to ensure the people in your parish know something about NCD before the Survey process begins. 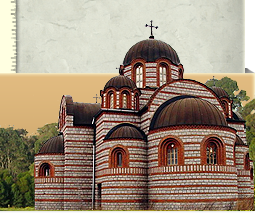 The two questionnaires: the Orthodox NCD Survey – Priest’s Form which collects basic information about your church, and the Orthodox NCD Survey Form, containing the main questionnaire. How do you take it to your leadership? Don’t try to summarize everything you have read on NCD. Often it is enough to ensure that every leader involved in the decision making process has read the ABCs booklet. The most important message to convey is that NCD is a process not a program and one that requires ongoing commitment to address the issues that arise with each annual Survey. Revisit with them the reasons why you personally believe it is important to get an annual assessment of the parish’s health. Stress that the NCD process takes the parish from where it is right now but adds the qualitative information that begins immediately to sharpen focus on the most important things. It is not a burden for leadership, but a release provided they are willing to address the issues it raises. Affirm that NCD has been tried and tested internationally for nearly twenty years. Refer people to the Orthodox NCD website if they want to go exploring for themselves. Direct any questions that you can’t answer to us at info@oncd.us. How do you choose people to do the Survey? The Orthodox NCD Survey – Priest’s Form is completed by the (senior, if more than one) parish priest. Other assigned or attached clergy, if selected to participate, can use the form below. If you have more than thirty people in your congregation, you select thirty people who fit all three criteria. Consider a broad range of people in the life of the church who fit the criteria, taking into consideration young vs. old, new members vs. long-time members, cradle vs. convert, male vs. female, etc. Leaders of larger parishes sometimes ask if they can survey more than 30 people. It is possible, but the software randomly selects 30 because no more are required to produce a statistically-accurate result. We recommend leaders take the time to reduce their list to the 30 people fitting the criteria whose opinion they value most or those they consider to have the greatest influence on church life. In any event, only 30 ONCD Surveys will be sent to the parish. If you have a parish of less than 30 people, you survey everyone as long as they fit all three criteria. How do you get the Survey forms completed? Once you have decided to begin the Survey process, contact Orthodox NCD at info@oncd.com. We will then send you the Survey forms and instructions. Call a meeting of the people selected to complete the forms. At the meeting give a short introduction and explain how long it will take (usually about thirty minutes). Holding the meeting after a church service (Saturday evening Vespers, Sunday morning Divine Liturgy, etc.) seems to work well. At the meeting, offer people a short explanation of the purpose of doing the Survey and why they were chosen. Hand out the questionnaires with a pen or pencil, go over the questionnaire instructions and let them begin. The fastest people take about 20 minutes and the slowest 40 minutes. Once all the questionnaires are complete, mail them back in to Orthodox NCD; allow about a week for the surveys to be received and scored. Caveat! Do not mail out questionnaires or allow people to take them home! Your workload will increase exponentially trying to get them back. It is also better that people offer their “gut” responses to the questions rather than spend a lot of time mulling over answers. 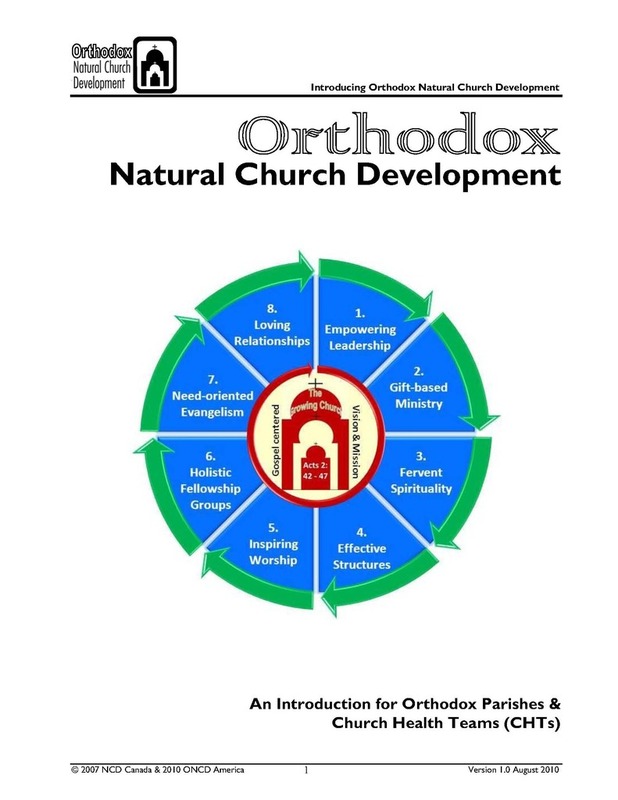 Orthodox NCD provides a profile which rates the health of the church on the eight quality characteristics. The rating is calculated by taking the raw scores from the questionnaires and measuring them against a standardization calculated from over 50,000 Surveys conducted across the United States since 1995. This gives you a very accurate assessment of the church’s health with respect to other churches. In 2004, the Profile Plus was introduced offering a question-by-question analysis of the results. Its value increases enormously as more surveys are done because it presents up to four sets of survey results on a single report. Changes in health from year to year can be tracked and matched against action taken to address specific health issues. Over time it also exposes long term trends, greatly enhancing the capacity to identify the deeper issues impeding healthy growth and make longer term decisions with confidence. Every parish in the ONCD process will now get this report as a matter of course. It is an indispensable tool for those who wish to see their church as an organic whole. (A sample Profile Plus from an actual church is available by clicking here). It is provided in digital – not printed – form. Other reports and tools are in development and will be announced when released. In most instances, results are emailed back to you within two weeks. You can find more information about ONCD resources - including the Survey and other material - here. It is inexpensive, effectively amounting to just a few dollars per week. The savings in time, energy and resources from being able to work consistently on the most important health issues facing the church far exceed the cost of the Survey. 1. Read the foundational resources. i. Go to www.oncd.us and click on the Resources tab. These resources are listed first. ii. Once you have reviewed the resources, email Orthodox NCD at info@oncd.com and place your order. 2. Discuss NCD in overview with your leadership team. Develop consensus and buy-in from leadership and ministry leaders. 3. Register for the Survey process. i. Contact us at info@oncd.com requesting the NCD Survey pack. ii. You will be sent the Orthodox NCD Survey – Orthodox Clergy Form, and the Orthodox NCD Survey – Lay Survey Forms and instructions for completing the Survey in your church (unless this has been sent to you previously). iii. If so desired, order The Profile Plus report; otherwise, you will receive only the basic graph. You will be invoiced. i. Use the instructions to select the Survey participants. ii. Write to those selected inviting them to meet after a church service to complete the Survey. You may wish to include a short explanation. 5. Prepare for the meeting. i. Prepare a short presentation to explain the purpose of the meeting (ten minutes maximum). Basing it on some of main points of the ABCs of Natural Church Development will suffice. ii. Review the instructions on the front of the NCD Survey Form so that you can take participants through it before they begin. 6. Hold the meeting and ensure all completed questionnaires are returned. i. 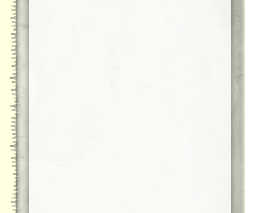 Deliver the presentation: short and simple. Assure people of anonymity. ii. Hand out the NCD Survey Form and take people through the instructions on the front page. iii. Invite people to return the form and leave as soon as they have finished. 7. Mail the NCD Surveys back for scoring. 8. We will email you the results (and Profile Plus report, if ordered) within approximately two weeks. A time of analysis and reflection now begins. The meaning of the scores, both on the survey and on the Profile Plus report, if ordered, will need to be reviewed, discussed, prayed over, and diagnosed by the parish. On the Orthodox NCD website, www.oncd.us, you will find further resources and tools to assist your parish in the further analysis and work needed to understand the survey results and plan and implement any necessary changes. If you are utilizing the services of an ONCD Certified Coach, especially if you are doing your first or second Surveys, it can be helpful to have your coach facilitate a results debriefing using the Profile Plus supplemental report. Such debriefs can be done with an on-site visit or via teleconference. The purpose of the debrief is not to tell you what you need to act upon but help you to use Profile Plus effectively in the process of assessing strengths and weaknesses, diagnosing the issues which most need attention. The debriefing should take no longer than an hour, but may take longer depending on the interest and involvement of the parish team created and assigned to review the Surveys. Contact us at Orthodox NCD to find out who may assist you. Such facilitation can be done separately from any planned or desired coaching. Once you have the skills in interpreting Profile Plus, you may not require such debriefs after a third or subsequent Survey, though it will always help to gain the insights on your results from an ONCD Certified Coach who has worked with other parishes who are at a similar stage or further advanced in their NCD journey. Contact ONCD or visit the website to view the names and profile of coaches in the Orthodox NCD coaching network. The resources you have at this point are sufficient to get you engaging with the critical health issues in the context of the NCD Cycle. There are, of course, other resources – NCD-specific and others – that may be helpful in understanding your Minimum Factor or taking steps to address it. 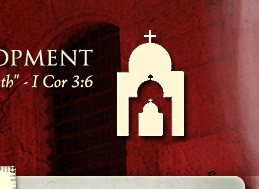 The NCD resources we specifically recommend are on the Orthodox NCD website, http://oncd.us/resources.html. Over the past ten years many different resources have been written that have either been NCD-specific or contained elements of NCD within the context of other church growth concepts and systems. A lot of that material is still available on the internet. Much of it is out-of-date or based on a limited knowledge of the NCD paradigm. Be careful. Do not fall for the “program trap,” the decision to go and find a ready-made solution to raising your Minimum Factor. The most critical element of the NCD Cycle process is that you and your leadership work hard at using the Survey results to diagnose the specific (unique) health issues your church needs to be addressing over the next twelve months. If this is done with care and effort, quite often the desire and need to go and find a program some other church has developed disappears. If you do go in that direction, remember that it needs to be adapted to address the specific issues identified in your results. The NCD International website - www.ncd-international.org - also has some very helpful introductory material, including numerous video seminars. You can sign up for the Institute's free online magazine eNCDine by clicking on the link to the NCD Portal site. ONCD will also be offering national and regional conferences on NCD themes and training beginning in the summer of 2011. Parishes can always benefit from the assistance of a coach in working through the results, developing and executing an action plan, and staying focused on implementing the NCD process over the long term. Orthodox NCD does offer the services of trained, experienced and certified coaches via our nationwide pan-Orthodox coaching network. Coaching costs vary according to the experience and competencies of the coach and are listed on the ONCD website.